What Are Esophagus And Trachea? Why Are They Located Close To Each Other? Why Is The Food Pipe (Esophagus) Located So Close To The Windpipe (Trachea)? 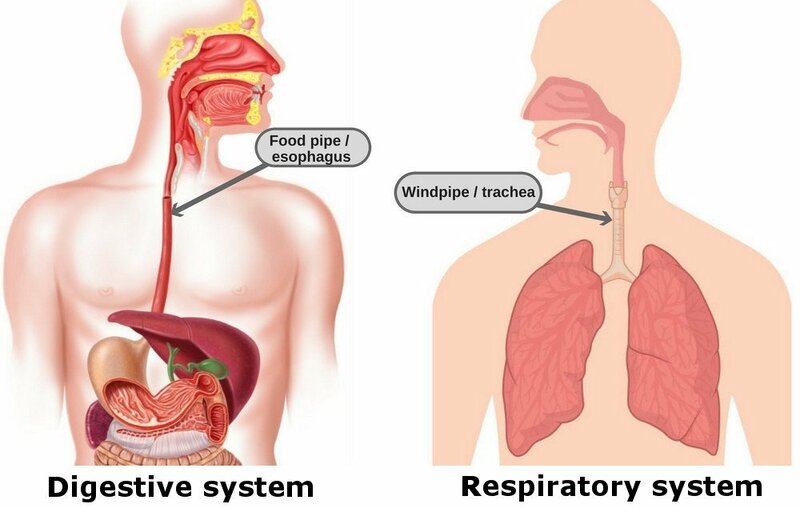 As you can clearly see in these two pictures, the food pipe (esophagus) and the windpipe (trachea) are located quite close – practically next to each other. Now, if you take a moment and think about it, you might determine that this configuration isn’t ideal from a safety perspective. You see, this positioning of the gullet opening and the trachea opening is a little risky, because while swallowing food, it may end up going to the wrong place (i.e., the trachea) and lead to disastrous consequences, because choking on food is a relatively common way to die. Wouldn’t it make more sense if evolution had separated our gullets from our tracheas and put a bit more of a physical gap between them? The pathways for food and air intersect in the pharynx. When one breathes, either through their nose or mouth, the incoming air always passes through the pharynx. Now, let’s talk a little about swallowing. Swallowing, as you can imagine, is an important part of survival; basically, it helps us eat and drink stuff. Simply put, without it, we wouldn’t be alive. Since it is such an important process, it comes as no surprise that it comprises complex neuromuscular activities that help to push food down the esophagus (also called “the gullet”). When we swallow food, the pharynx becomes a passage for it. However, since the pharynx also acts as a passage for air, there must be a mechanism in place that ensures the ingested food does not enter the trachea, where it could block the passage of air. Enter the epiglottis. A tiny flap called the epiglottis, composed of elastic cartilage and covered with a mucous membrane, is the main/only player that makes sure your ingested food does not enter the trachea. It is located at the entrance of the larynx, and points dorsally. It’s the epiglottis that separates the nasal cavity and the lower airway from the passage of food while swallowing. You see, when you breathe, this flap-like structure opens to allow the incoming air to pass through the windpipe and into the lungs. However, when you swallow food or any liquid, it closes (thereby shutting off the windpipe for a brief moment), so that the ingested material only goes down the esophagus (and not the windpipe). 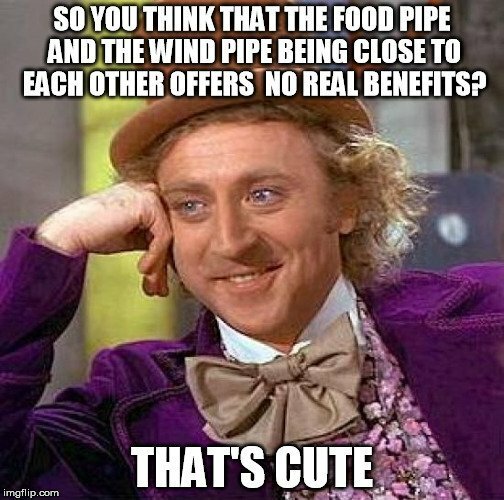 Why are the windpipe and food pipe located so close to each other? The incredible proximity of the windpipe to the food pipe seems risky. As such, if the mechanism of the epiglottis fails – which it occasionally does, whereas swallowing (and hence coughing) it can be quite dangerous. This choking can even be lethal if the ingested pieces of food are large enough to block the passage of air. On the outside, it seems that if, during our evolution, the windpipe had become completely separated from the gullet leading to the stomach, then this problem would not exist. However, interestingly, the risks are compensated by far more important advantages that this positioning offers. First off, the ability to speak ‘properly’ (i.e., when words are enunciated precisely enough) depends on the directions of vocalizations coming out of the mouth through the lips. All other critters have windpipes that intersect the esophagus much farther from the mouth. While this reduces their risk of choking on food, it also means that the only sounds they can produce are yelps, barks and growls, but not clear words like humans speak. t is important to note that animals still couldn’t speak, even if they had the same anatomical structures to produce sounds as we do, but that’s a different story altogether…. More specifically, it could be said that this positioning of the two ‘pipes’ is a result of natural selection and evolution that gave our primate ancestors the ability to communicate. This obviously proved to be a competitive edge over other species over an extended period of time. Furthermore, we use the large cavities in our mouths and noses to moisten and heat the air that we breathe, which, in turn, makes it easier for the lungs to absorb oxygen. Finally, when we feel too hot, we use the air that we exhale to cool the body by blowing out hot steam from the inner surfaces of the mouth and nose. In a nutshell, the current positioning of the trachea and the esophagus may seem a little risky, but it also simultaneously helps us to communicate and provides various other important health benefits. 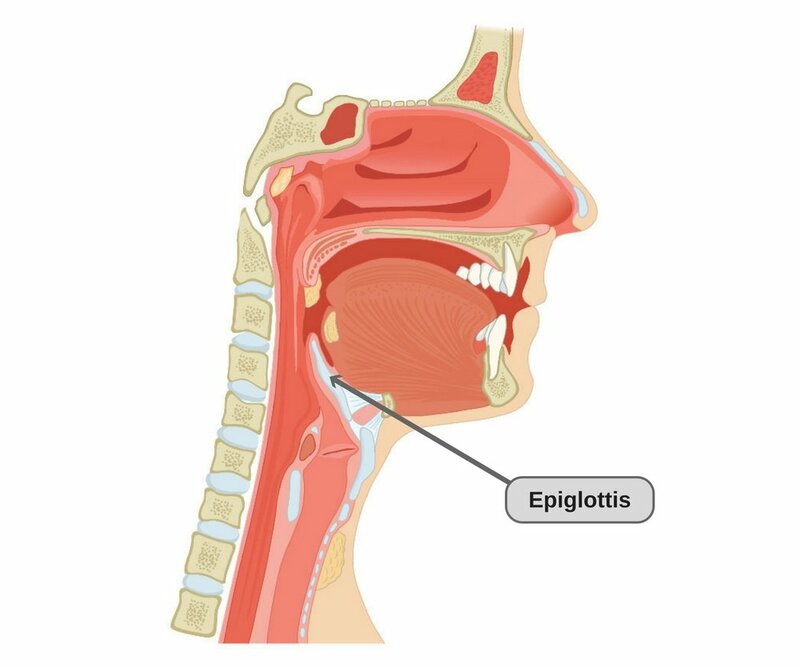 Good article… i wasn’t sure how the swallowing and breathing mechanisms interacted, my teachers didn’t bother to mention this epiglottis (it seems a vital organ everybody should know about). Thx! Is it possible,as one gets older that the epiglottis weakens? Over the last few years I’ve had trouble with choking on my own saliva . This happens if I’m lay on my back or side, while starting to fall asleep, l find that the only position to fall asleep is on my side,with my head bent forward so my chin rests on my chest. Is there anything I can do about this problem? Thanks for this important and educative article about our body! Swallowing and breathing systems are complicated but,with your help through this article,main points have been explained and understood.